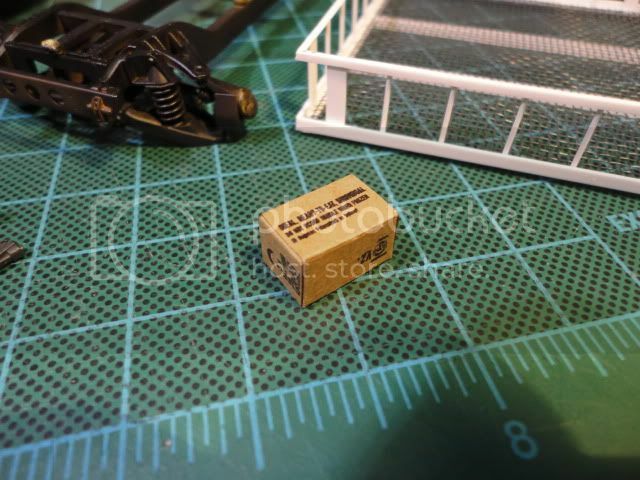 J's Work is a company out of China manufacturing diorama accessories for modelers in both 1/35 and 1/48 scale. Their previous releases have covered foliage and some basic building parts such as tiles and paver stones. Now they have released a series of rations boxes for modern vehicles. I have a couple of kits to build and wanted something to go with the kit and found these online, so I thought I would give them a try. The ration boxes come packaged in a simple, clear plastic sleeve. They come on a single, sturdy piece of brown card stock the color of cardboard. There are 9 ration boxes that appear to be laser cut into the paper. The printing on the surface of the boxes is not clearly defined, but "meals, ready to eat" is legible. On the reverse side there are lines printed showing the folds to be made. They look (at least to me) like the ration boxes I have seen MREs carried in. The box cuts out easily, with only for small attachment points. The paper is stiff and easy to handle. The fold lines printed on the back allow the paper to be bent easily by hand on a straight angle. I started each of the folds, and then assembled the box just as I would a full size version. I used odorless CA glue to attach the sides, and then folded the top in. The boxes are made so they can be left open, either to show an empty box or other items you might find handy to place in them. Unfortunately, J's Work does not offer the actual MRE to go in the box. Assembly of the boxes is easy and only took about two minutes. The material is sturdy to work with and simple to fold, and they look very nice when completed. The thickness of the stock used appears to be good for scale as well. If you are looking for some simple, handy aftermarket additions to any of the modern AFV kits that are currently available (and more are coming out), this is a good place to start. I purchased my sample at Lucky Model for $2.99 US with free shipping. Highs: Easy to use, well made. Lows: Printing is, for the most part, not legible. It would be nice to have the MRE packets to go inside. Verdict: This is a nice looking, simple diorama accessory for modern armor fans. James, thanks for your help with this review. James, I'm looking at a few more items from them. For the diorama impaired like me, it's a perfect solution. Dave, thanks for the comments. I just sent in a review of the medical boxes. they do have two other sets of rations boxes . . .